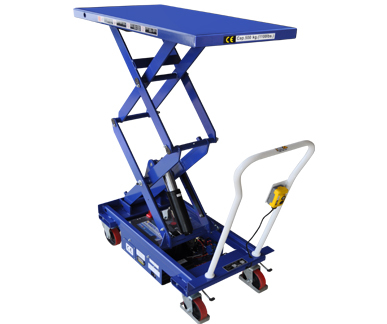 Optimums range of Heavy Duty Electric Scissor Lift Trolleys are the ultimate solution when a quick lift is required with minimal effort. Lifting twice as fast as the manual scissor lift version makes the electric model a great investment when used on a constant day to day basis. 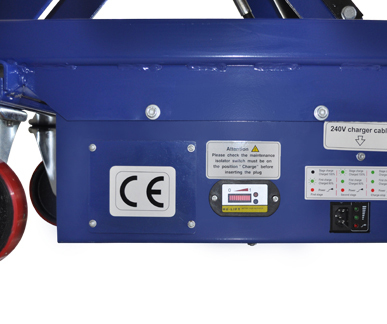 With a lifting capacity of 300-1000kg makes light work of any job and fitted with an on-board single phase battery charger requires only a 240volt power outlet to plug into at the end of each shift. With a simple push button control panel and this great little 4 wheeled hand trolleys recommended for many manufacturing and processing plant’s looking to increase their level of safety and efficiency. 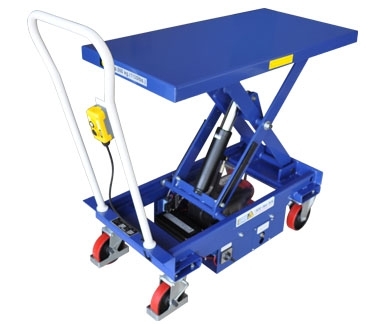 If you'd like more information or if you have any enquiries about the Electric Scissor Lift Trolley, please call 1800 066 008 or click HERE to contact us online and we will contact you. Optimums Heavy Duty Double Electric Scissor Lift Trolleys are the ultimate solution when a high lift is required with minimal effort. Lifting twice as fast as the manual scissor lift version makes the double electric model a great investment when used on a constant day to day basis. With a lifting capacity of 300-800kg makes light work of any job and fitted with an on-board single phase battery charger requires only a 240volt power outlet to plug into at the end of each shift. 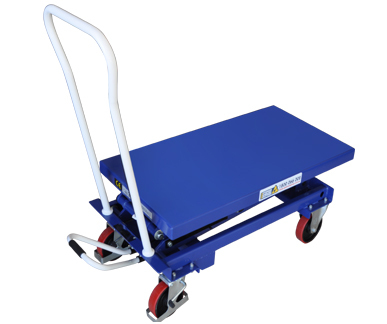 With a simple push button control panel and this great little 4 wheeled hand trolleys recommended for many manufacturing and processing plant’s looking to increase their level of safety and efficiency. 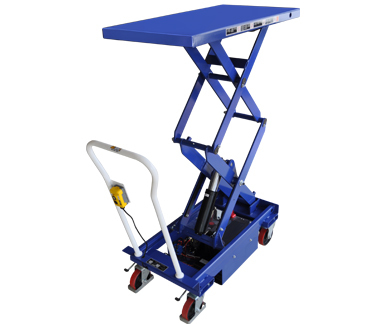 If you'd like more information or if you have any enquiries about the Electric Double Scissor Lift Trolley, please call 1800 066 008 or click HERE to contact us online and we will contact you. 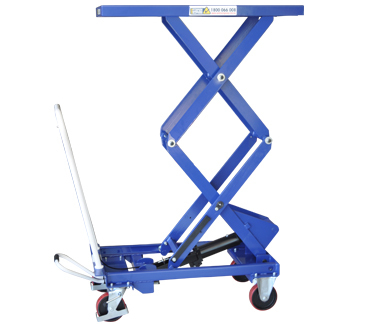 Optimums range of Heavy Duty Manual Scissor Lift Trolleys are a very useful and simple back saving piece of equipment that every work place needs. 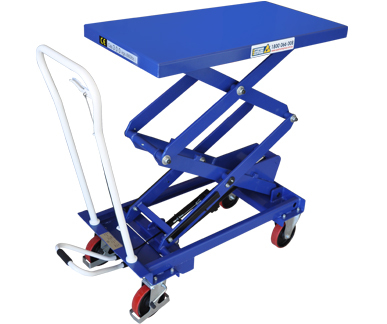 Designed to bring the loaded table to a comfortable working height to eliminate the need to bend or lift when shifting or working on loads. 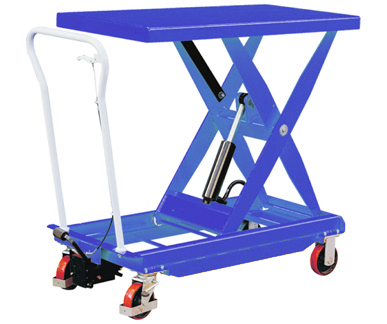 Optimums Scissor Trolleys are a very simple 4 wheeled hand trolley where the platform is raised and lowered by a foot pumped hydraulic powered scissor mechanism. 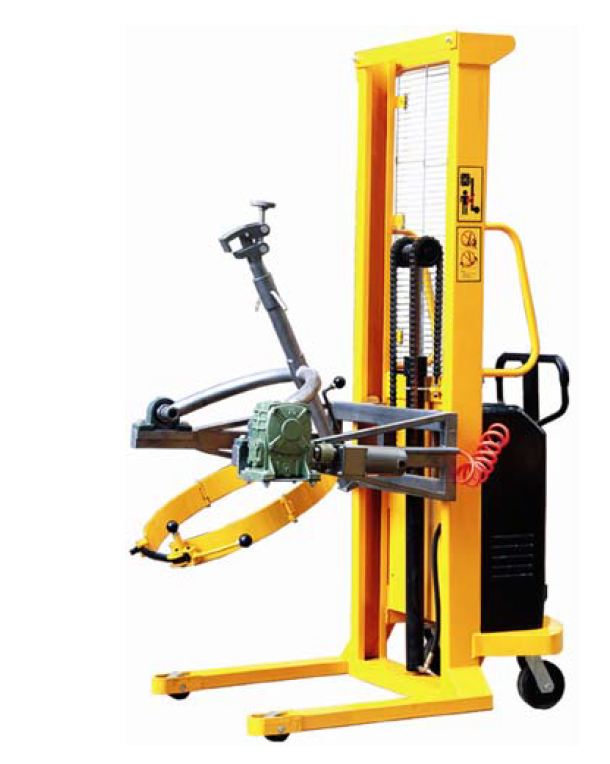 With capacity from 250kg – 1000kg this lifter has a multitude of uses in workshops, warehouses, food processing plants and manufacturing sites. If you'd like more information or if you have any enquiries about the Manual Scissor Lift Trolley, please call 1800 066 008 or click HERE to contact us online and we will contact you. Optimums Heavy Duty Double Scissor Trolleys are identical in concept to the single scissor units but will lift much higher which makes them very useful in the installation and construction industry. A dual scissor mechanism operated by hydraulic foot pump allows for safe, stable load lowering and raising to heights up to 1.6m. With load capacities from 300kg – 800kg Optimums Double Lifters are the ideal solution for workshops, installers and maintenance applications – contact Optimum to discuss your needs. Optimums battery powered bin lifters are the perfect choice for transporting, positioning, stacking or tipping loads safely and efficiently. 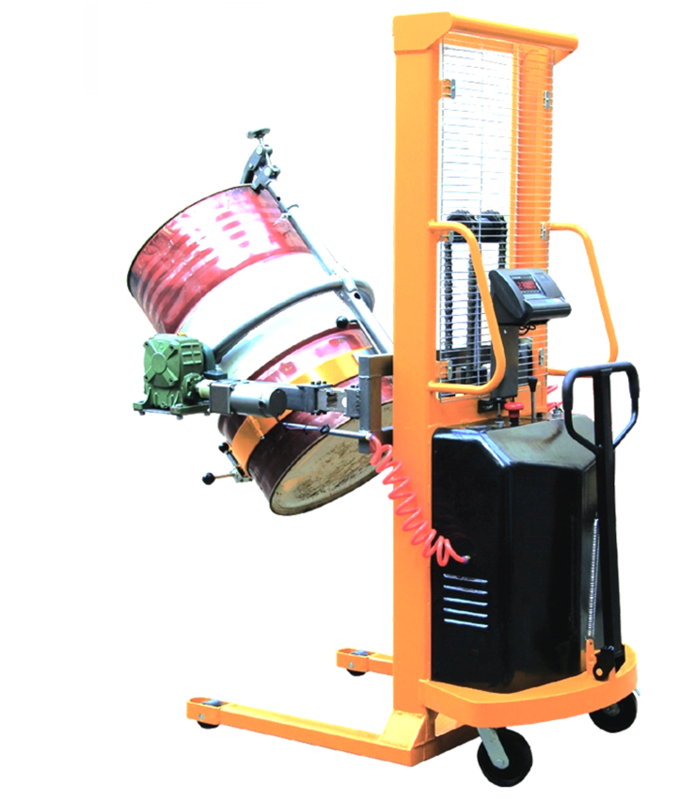 Suitable for 55 gallon, 208 litre, steel & plastic drums, this safety conscious self-prpelled drum stacker, allows you to move drums on and off racks, pallets, trucks. Ideal for stacking in horizontal position, or use for tipping of liquids. These are lightweight and highly manoeuvrable units that have been well proven in the food, wine and meat processing industry. If you'd like more information or if you have any enquiries about the Electric Brute Bin Tipper, please call 1800 066 008 or click HERE to contact us online and we will contact you. 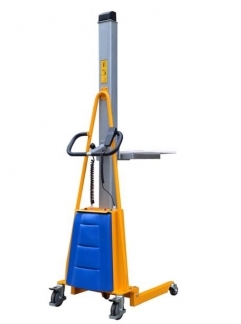 The Optimum Electric Lift Platform suits a wide variety of applications. The highly maneuverable, lightweight lifts are designed to take the strain out of any lifting job from ground level to over shoulder height. Idea for use in narrow aisles and confined spaces. 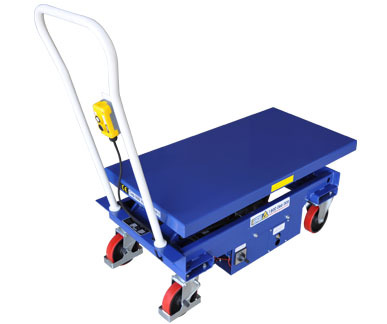 If you'd like more information or if you have any enquiries about the Electric Lift Platform Trolley, please call 1800 066 008 or click HERE to contact us online and we will contact you. If you'd like more information or if you have any enquiries about Heavy Duty Gripper Rotater Solutions, please call 1800 066 008 or click HERE to contact us online and we will contact you.